With ACH now offering same-day credits and debits, business cycles are speeding up as a result. However, since a faster pace can also mean more mistakes, it is important to know how to identify the risks and mitigate them when speeding up the sales cycle. European payment processing companies are now advertising real-time settlement options, but faster does not always mean better. Increased liability issues and fraud risks make speed in payment processing a risk, so it is crucial to implement faster payments in ways that improve the customer experience and follow industry best practices. As payment processing changes, internal business practices need to adjust to the new ways in which transactions reach settlements. Traditionally, the effective entry date of a transaction was the same as the settlement date. With faster processing options, a same-day effective date translates into same-day payment processing. Since faster processing also involves a higher fee structure, these details can dramatically impact businesses. Before adopting faster payments, be sure to audit internal processes to ensure compliance with new standards. Adding same-day payments can improve cash flow, but only if a business can support the new structures needed to handle the change. While speeding up the payment cycle carries increased risk in areas like fraud mitigation and erroneous charges, slower payments also carry risk factors. When businesses wait three to five days for a transaction to finalize, all they have in the bank is an IOU. Until the transfer of funds is complete, a business is left with no way to guarantee payment. Also, slower transactions do not negate the risk of fraud or chargebacks. Because payment cycles are speeding up and the risks involved are well documented, businesses can either meet customer demand or risk getting left behind. 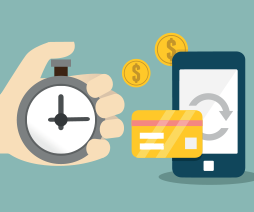 Before implementing faster payment processing, businesses need to understand the limitations. For example, a car dealership may not find faster payments an attractive solution when the transaction limit is $25,000. Wholesale companies and manufacturers may be similarly hampered by the transaction limit when the average invoice exceeds the limit. Business processes, billing and invoice tracking software and other systems also may need adjustment to handle the move to faster payments. Both businesses and consumers see the benefits of faster payment processing, so the biggest barrier is often availability and potential costs. Existing fraud prevention strategies help mitigate the risks involved with faster processing for businesses and consumers. Most of the risk is transferred to the financial institutions handling the transactions. To mitigate these risks, financial institutions may institute policies like the one surrounding the use of EMV chip readers. Be prepared to follow guidelines as they become available. Keeping up with changing policies is the only way to keep fees as low as possible and minimize exposure when handling transactions in a system that is moving toward real-time transfers.